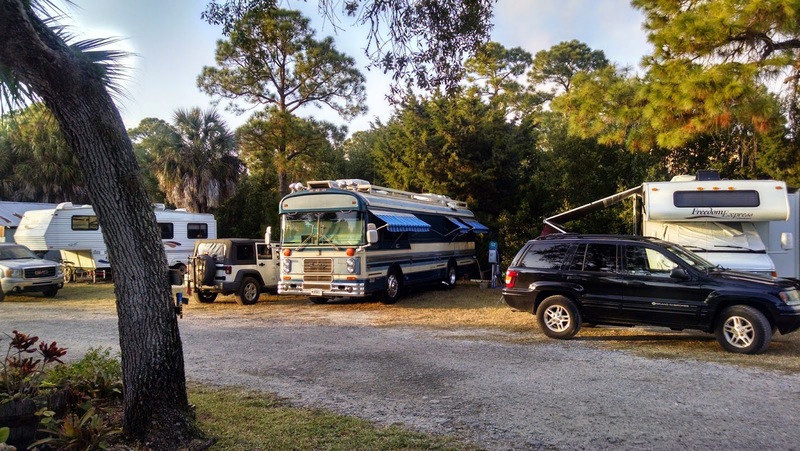 We returned to Sunset Isle RV park in Cedar Key Florida a few days before Thanksgiving. We brought the cold with us and as we caught our first sunset from the dock we prepared for the frost that was forecast for that night. We quickly settled into a routine, working from the RV, using campground WiFi when it was sufficient to save the expensive, but much faster, Verizon connection for video conferencing. We were getting 3 to 5 Megs from the campground (shared with the rest of the campers) with 15 to 30 Megs available from a Verizon tower several miles away. The roof antenna and the cell booster really helped in this marginal signal situation. For most of the stay we had the luxury of an un-metered Verizon connection, a by product of Verizon taking over our Millenicom account and leaving it on while they contacted all the Millenicom customers to discuss subscribing through Verizon. When they called me I explained that I had already added 40 Gigs of data to my Verizon cell phone account (taking advantage of a limited time 2 for 1 deal) and they asked if I wanted the Millenicom account shut off. At their suggestion I asked that it be left on until whenever, and it was! As sunset approached we would shut down our computers and go out to the dock to meet fellow campers and enjoy the sunset. Every sunset is different. Some days we would walk down to the Tiki Bar at the Low Key Hideaway to watch the sun go down with company and adult beverages. Soon it was Thanksgiving and the campground owners hosted a holiday pot luck featuring their home smoked turkey and ham. There is a different crowd of people at Sunset Isle this year as there is no Nu RVer convergence like there was last year, but people are still friendly and easy to meet, there is bluegrass and potlucks in the club house and time flies quickly in this laid back, rural South community. While Lucie worked on organizing a state wide celebration of the "Hour of Code" I puttered on the Printrbot Simple 3d printer that we had built from a kit at the Maker Faire in Vermont a month ago. Actually it is a misnomer to say we built it, we oversaw the participants who visited our table at the Maker Faire as they assembled the kit one step at a time. We decided that we would bring it with us this winter as our traveling 3d printer, but had to get it working first. After Printrbot sent us a new controller board it started working and I started tightening and adjusting until now it gives us just as good results as any of our other 3d printers that we left at the Generator back in Vermont. Along with the 3d printing both Lucie and I have been playing with eTextiles. Adding circuits, microprocessors, lights and sensors to fabrics and wearable items. Lucie made a holiday hat as a group project with fellow educators. This was a part of her Ignite a Maker project where she is sponsoring small teams of teachers back in Vermont as they explore using Maker techniques in classrooms. ETextiles is especially attractive to young women and is a gateway activity to get them interested in engineering and electronics. I made a little Christmas tree with flashing lights, but learned a lot about using circuits and textiles. During the week after Thanksgiving we ceased to be the oldest RV at Sunset Island. We discovered that the campground was going to be the site of a gathering of the Tin Can Tourists. It was exciting to see all these restored and functional RVs pulling in and setting up. We got to meet the people who enthusiastically keep these mobile dwellings on the road. Many were pulled by period cars and it was very common to see each dwelling furnished with period appropriate items. Once the rally began there were lots of activities that because we were not members we just watched, but for most of the second day there was an open house, where people toured each others rigs. We welcomed many people into our Wanderlodge (got us to clean it up!) and spent some time checking out everyone else's. 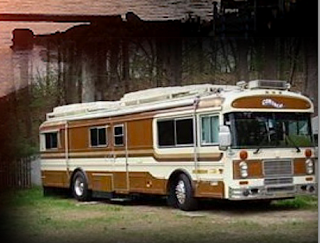 Great serendipity for this group of classic RV aficionados to share our campground this winter weekend! Of course there were sunsets to share with all of the Tin Can Tourists. One of the challenges of hanging out in Florida is getting into the Christmas Spirit. 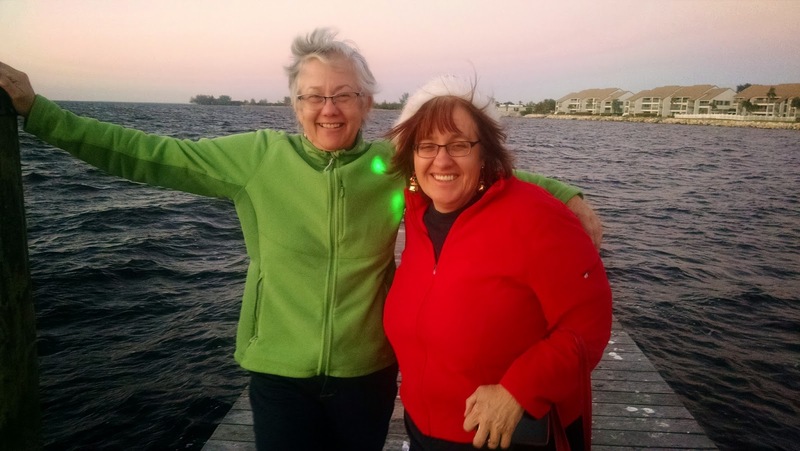 We missed the Christmas Boat Parade with Santa Clam because we drove down to the Tampa area to visit friends Deb and Frank McCarthy who moved down there from Vermont this fall. We had a nice dinner together. On Dec 16th Lucie flew out of Gainsville to return back to Vermont for the holidays. We spent the night before at a hotel in Gainsville with a hot tub. The last part of Lucie's birthday! When I returned to Sunset Island I was delighted to watch another Wanderlodge move in across the road. Now we have the Wanderlodge part of the campground. On Dec 19th I fired up the Cat, hooked up the Saturn and headed out on a 300 mile drive to our next destination, Lake Worth Florida. We will be returning to Sunset Island for 2 weeks in early February on our way out of Florida as we head towards Austin Texas.